Rachel Lynn Rose is not afraid. Not of electricity. Nor insects. Nor boundaries. 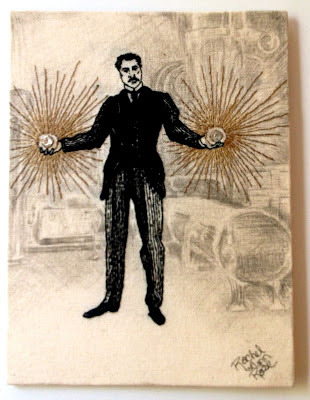 Nikola Tesla, 2013, by Rachel Lynn Rose. 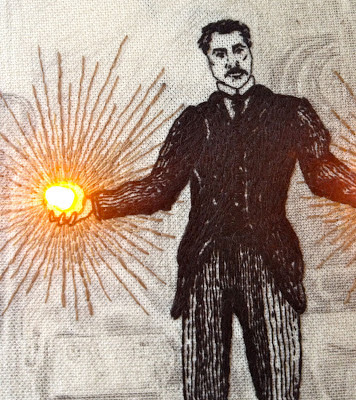 When I received her Nikola Tesla embroidery in the Phat Quarter Blinded by Science Swap, I could not believe my eyes. The design of the piece, stitched in fine thread against a trompe l'oeil ground fabric, is simple and the stitching is perfect. But Rachel did not stop there. 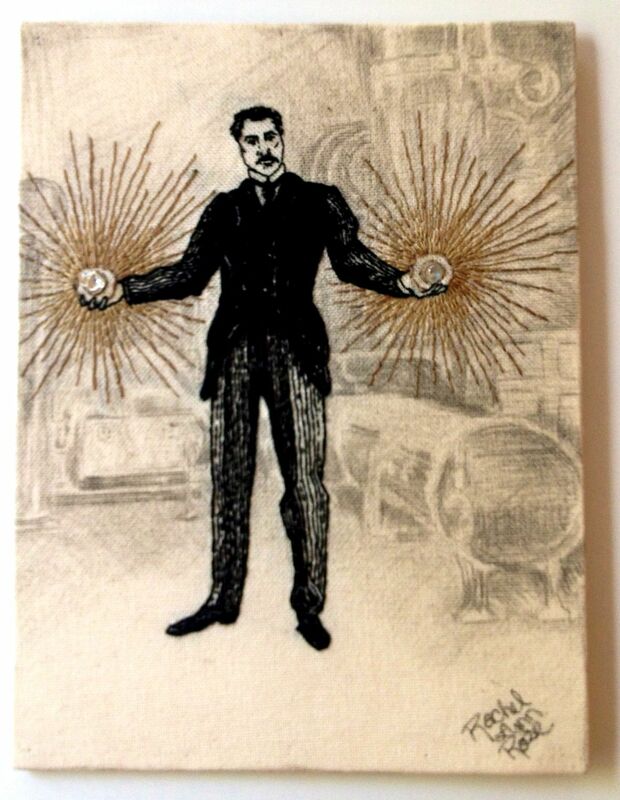 She inserted LED lights to form globes in each of Tesla's outstretched hands. 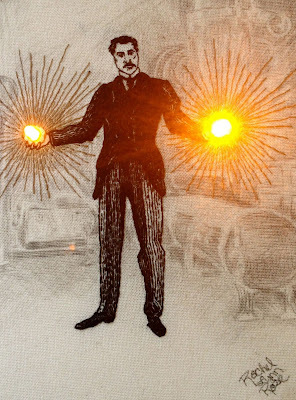 She even created rays around the globes with conductive thread. Conductive thread around the LED globe. I first noticed Rachel's facility with united various mediums in her textile art when she embroidered the top of a Coney Island hotdog container. So clever AND perfectly rendered. 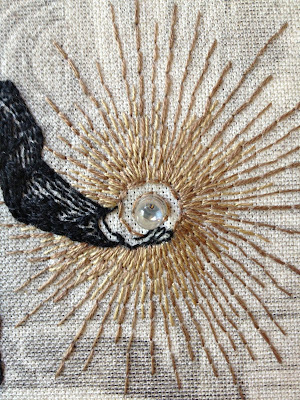 And her collection of eerily embroidered insect art, Invisible Empire, is luminous and strange. She is simply amazing. Please spend some time with her beautiful work. I can't wait to see more. I'm beyond inspired. The last few weeks have been more about experimentation with mediums than finishing art projects. 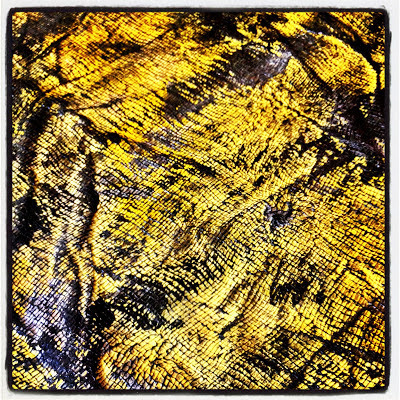 Painted fabric paper. Needs more glitter! 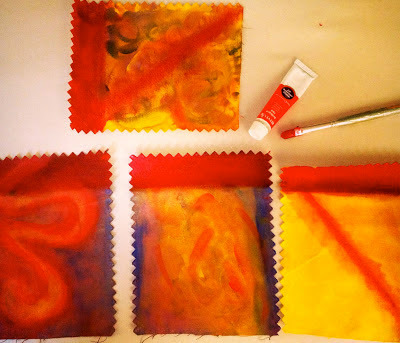 Oil paints on squares from a fabric sample book. I'm trying out oils, acrylics and watercolors. I have an idea for a woven piece that I want to attempt that was inspired by the El Anatsui exhibition I saw a couple of weeks ago at the Brooklyn Museum. But I've never done this kind of work before, so I'm in the very early draft phase. 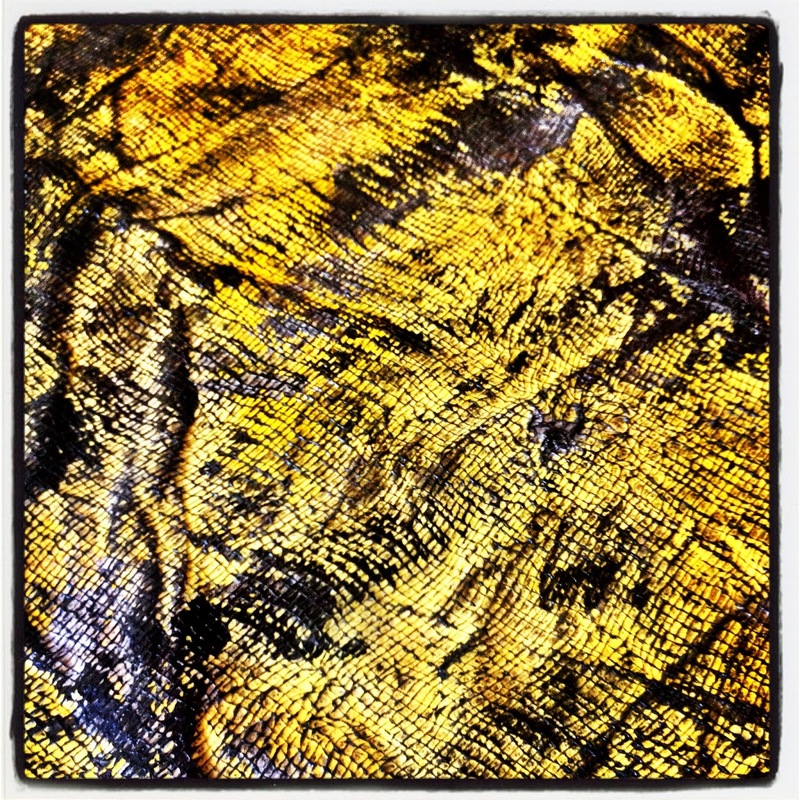 Fabric paper made with cheesecloth. 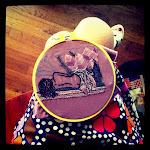 And I'm going through a French knot obsession, which I think most stitchers go through. Is there anything more textural and beautiful than French knots? And feather stitch? French knots, ink, oil paint and stitch on vintage linen. WIPs and sketches are strewn about my apartment. I'm grateful that my friends have not disowned me because of the chaotic mess. An uncharacteristically monochromatic piece. 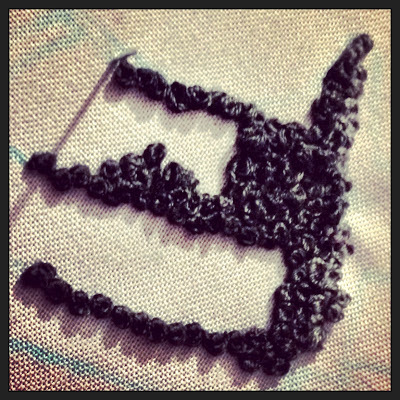 But still, French knots WIP. 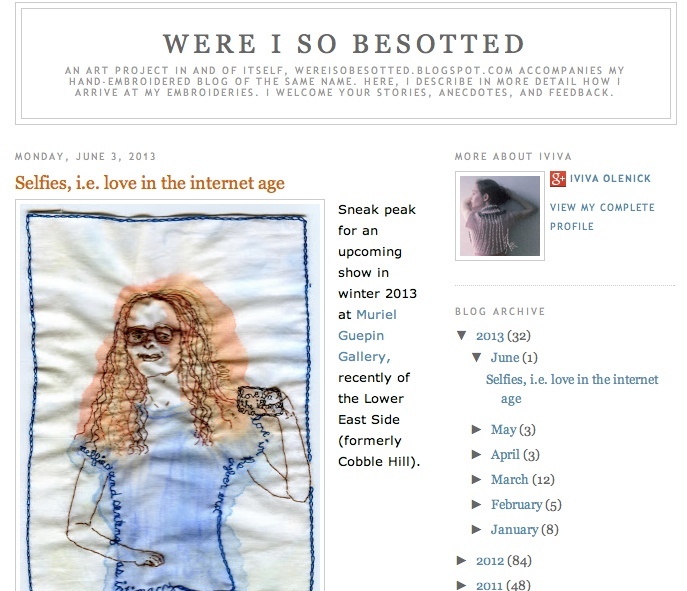 I was so inspired by Iviva Olenick's "embroidery slam" #BrooklynTweets. I've been finding poetry everywhere. And stitching a bit of it. 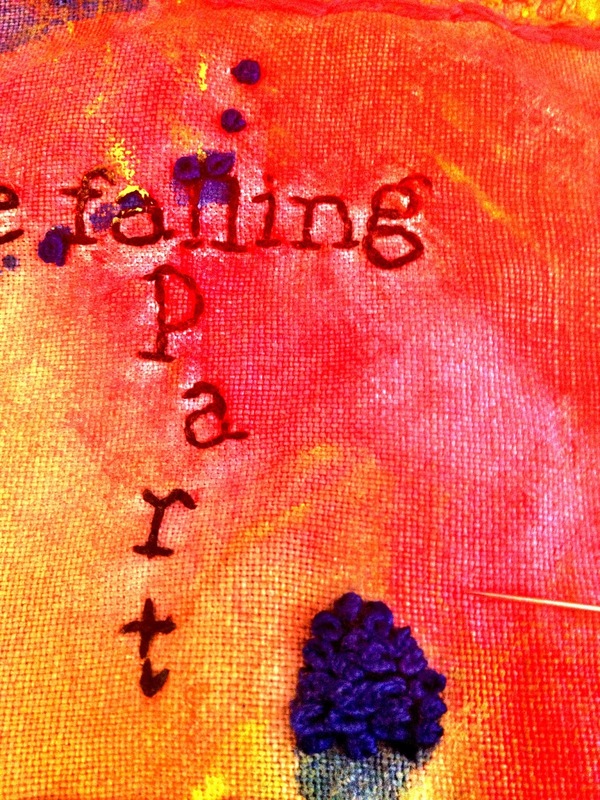 A found poem in stitch. Last weekend, my fiber arts group Durham String Thing taught weaving at the North Carolina Maker Faire. The event itself was a little overwhelming... so much creative energy packed into a small, loud space. 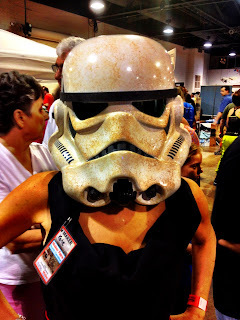 But my boyfriend and I got to try on a handmade Stormtrooper's helmet. 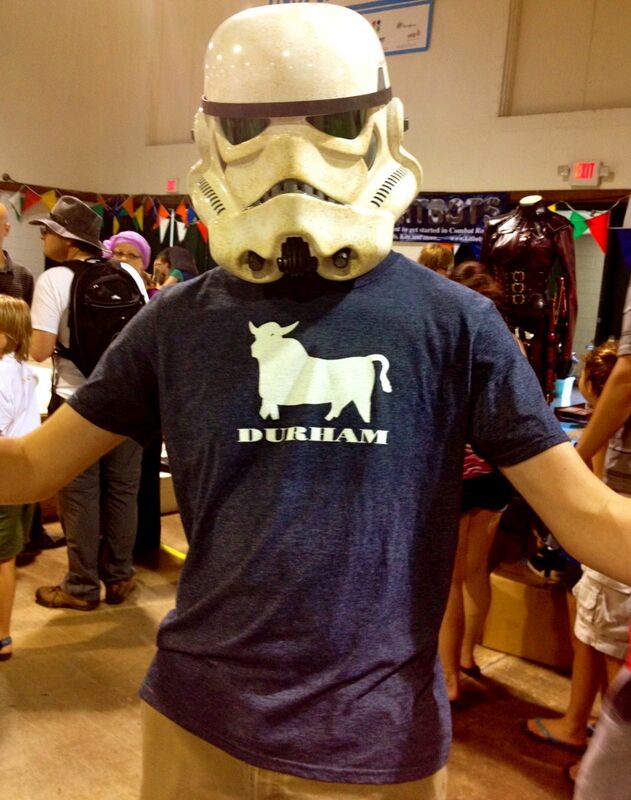 That set my Star Wars loving nerd-heart aflame! Warning: Attempt Jedi mind tricks at your own risk. "I am big, it's the pictures that got small!" -- Gloria Swanson as Norma Desmond in Sunset Boulevard (1950). Oh, you, Ru. I've stitched you on buses, planes and trains. In cafes and bars. With a needle in my vein during a 6-hour infusions of iron. In my own bed and in others. And you are finally ready for your close-up, dear girl. 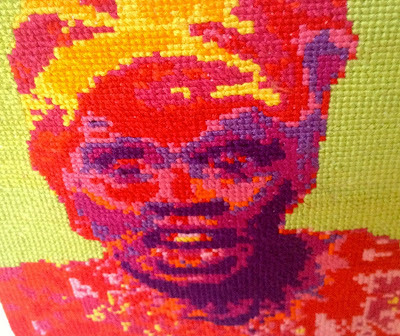 Frame 11, my first ever x stitch project, is on its way to the magic-artist-ringleader, Aubrey Longley-Cook, in Atlanta, to join its 34 other stitched cellmates in Aubrey's animated short video. 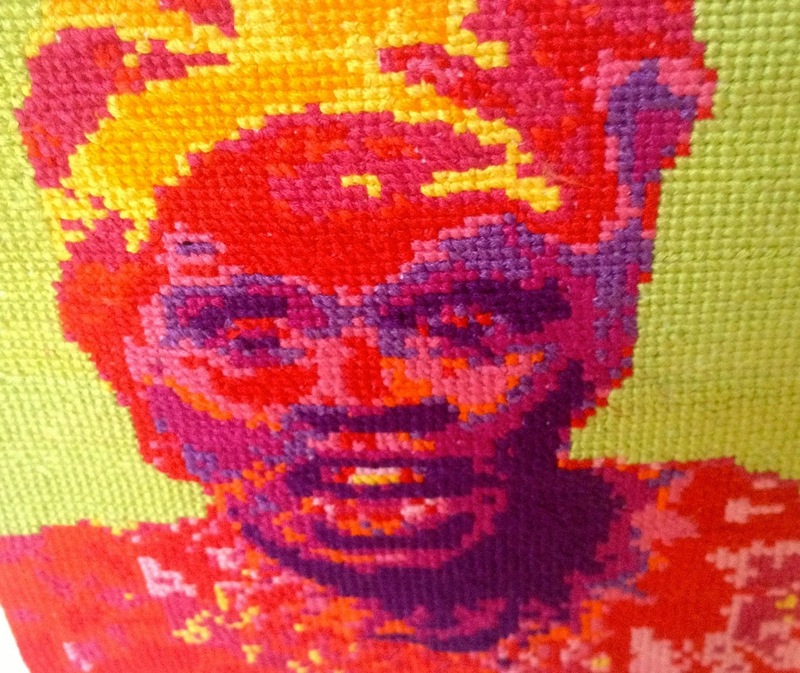 A close-up of Frame 11, 2013. The video will premiere in Aubrey's gallery show at the Barbara Archer Gallery in September and will screen as a part of the outdoor art installation the Window Project, also this fall. More to come as Aubrey's bigger project comes together. For now, let me say, this has been a great learning process for me. My stitches are deeply flawed. Reading the chart was harder than I'd realized. My friend Kate, who is the neatest cross stitcher in the world and taught me how to do cross stitch, would be horrified by the back of the piece. Frame 20, by Nathan Sharratt, conceptual artist. 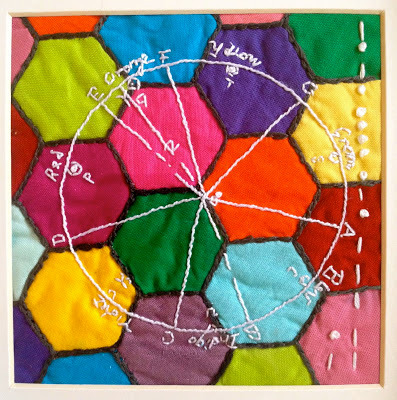 Visit Iviva Olenick's blog for more about her artwork. I feel a bit lost and loose after this project. And a little sad... I'll miss the frame. And I'll miss working with Aubrey, who is a warm, hugely creative soul. I’m headed to Brooklyn tomorrow to visit one of my very favorite families in the whole wide world, the KINSELLAS! And I timed my trip to so that I can meet an artist that I greatly admire, Iviva Olenick, and participate in a fantastic art experience she is producing. a poetry reading and musical performance. As poets read and musicians play, embroiderers will stitch snippets of lyrics and verse to create new, “found” poems. 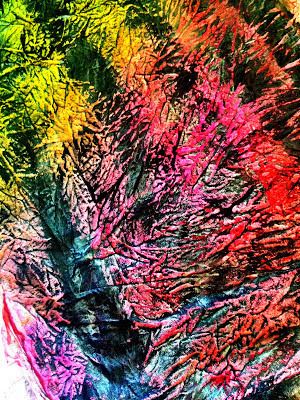 It should be a boundary-pushing, artistic night. 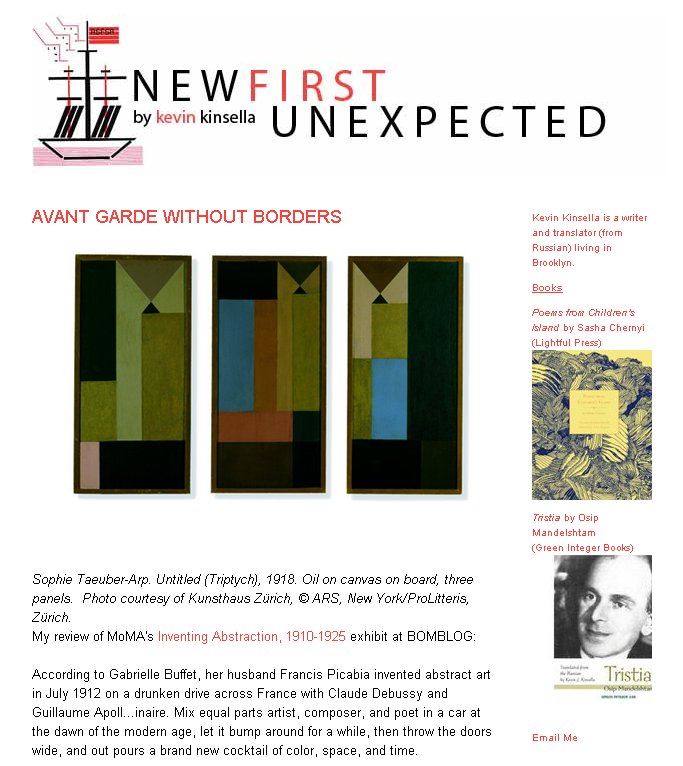 Kevin Kinsella's art criticism blog, New First Unexpected. I’m also thrilled that poet, blogger and Russian translator Kevin Kinsella will be reading his poetry at the event. So if you’re in the NYC area on Thursday, 6/6/13, please come to the Local 61. I’d love to meet you! Read more about Olenick’s project on the New York Times Magazine blog. And if you're there, please say hello, OK? Color wheels are amazing orbs. 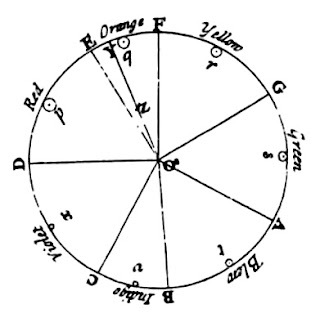 When I found a color wheel hand-drawn by one of my all-time science crushes, Sir Isaac Newton, I felt giddy. His fascination with the color spectrum thrilled me. 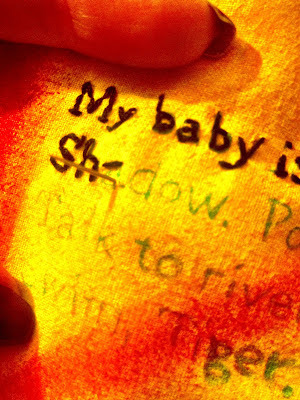 And like most things I stumble upon that capture my attention, I instantly wanted to stitch it. 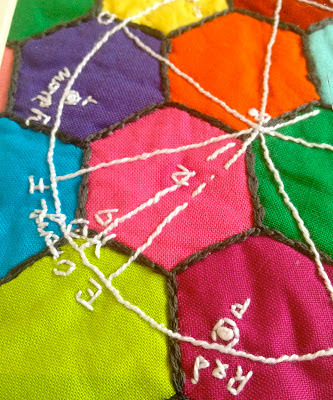 Detail of chain stitched "grout." 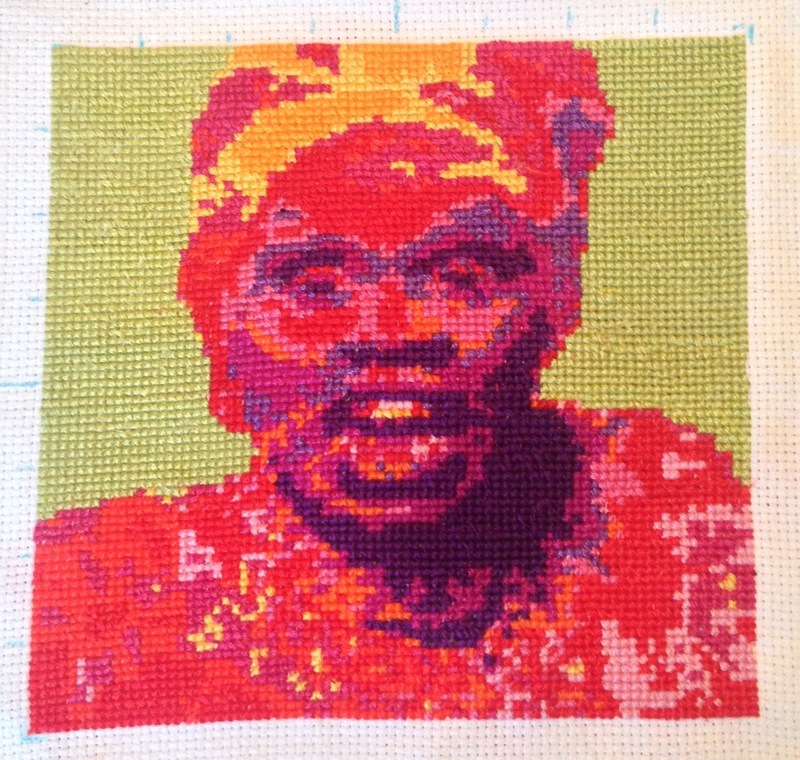 But I don't wind up stitching everything I want to. Time constraits, my own distractibility, an overly exuberant nature... these all stop me from tackling every project I play with in my sketchbook. So I filed away Newton's color wheel with all of my other ideas. 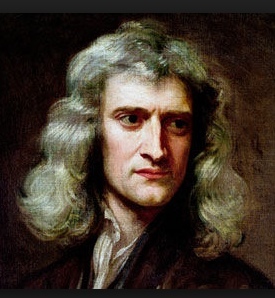 Then, early one morning, in those liminal hours between sleeping, dreaming and waking, the image of Newton's drawing flooded back into my imagination. "Chroma" in Morse code along the edge. Always. I had just selected the "Blinded by Science" theme for the Phat Quater swap (which I host), but I had no idea what I wanted to make. 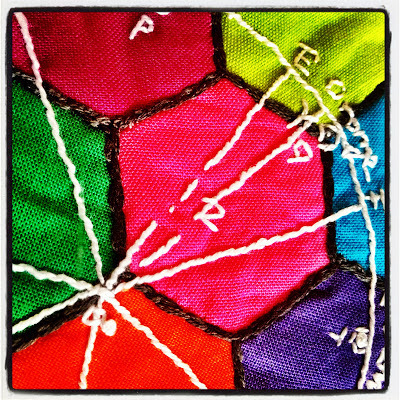 In the dark, almost colorless bedroom, a shimmering image Newton's color wheel, suspended over something like multi-colored, mosaic stones, floated into my consciousness. I woke up describing it before I understood what I was even talking about. And, just then, I knew that I had to try to make it for the uber talented Elli Course, a.k.a. Sister Twisty. Newton's codes, in his own writing, for light refraction. 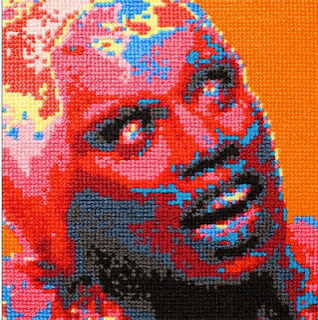 But how to translate the mosaics of my imagination into a textile piece? 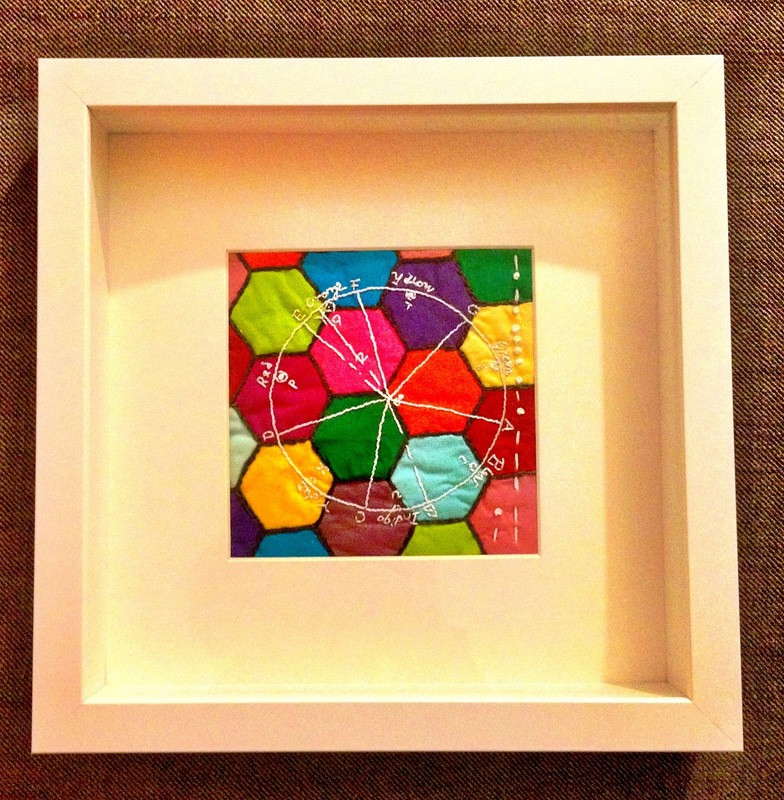 I decided to experiment with paper-pieced, 3/4 inch hexagons. 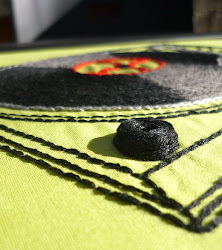 And to simulate the charcoal grout with a think chain stitch. 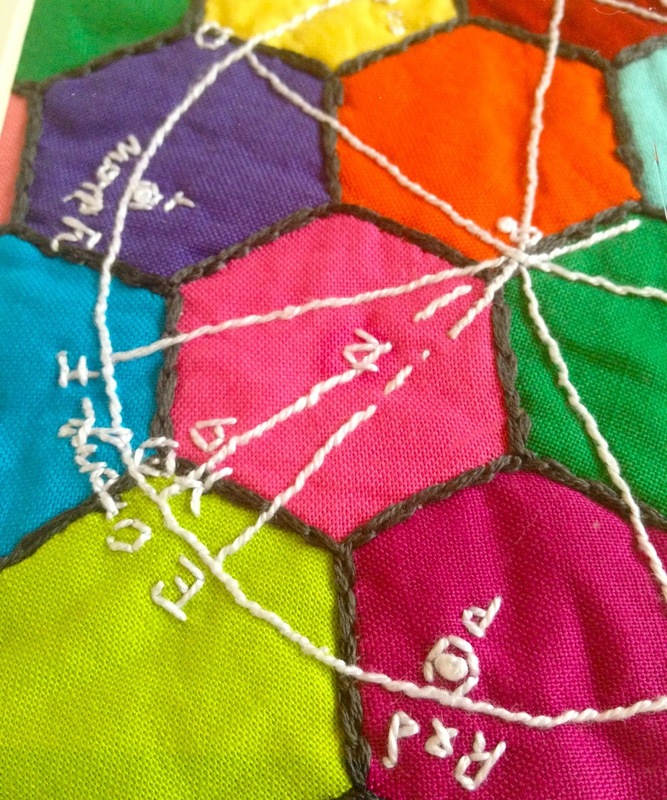 I've never stitched over paper-pieced ground fabric before. 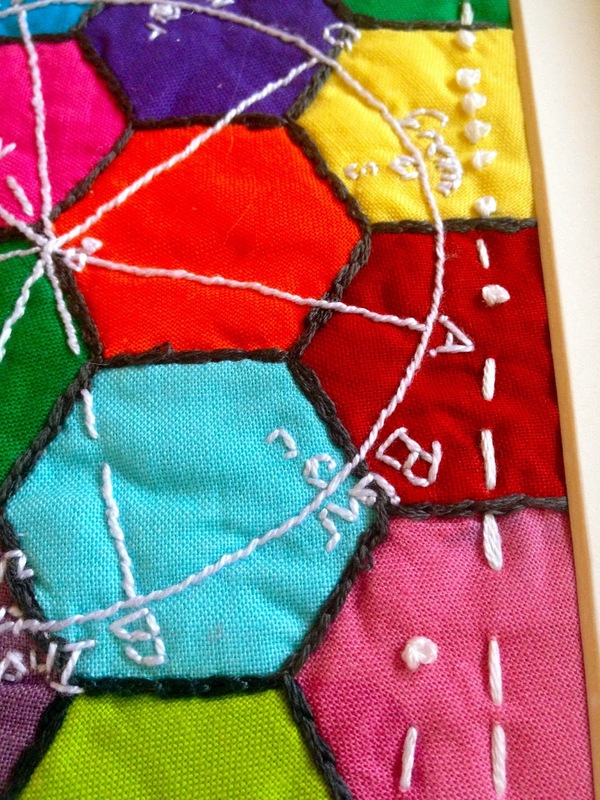 But I love layers in my textiles (layers of stitch, layers of fabric) so I will go back to this again. 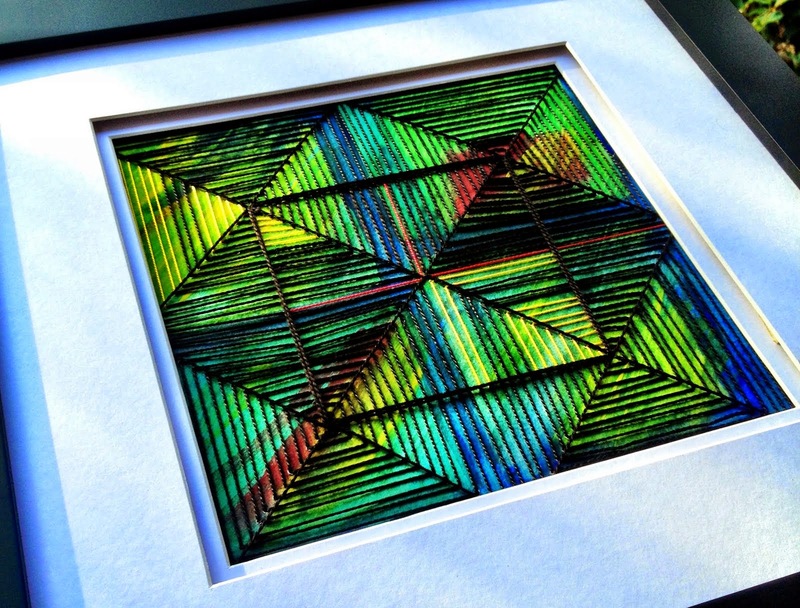 Perhaps try different shapes for my paper-piecing. Chroma de Newton, 2013, framed. Chroma de Newton's journey to York, U.K., was fraught, but after being locked up in British customs for what I'm sure was bad behavior, it finally found its way to Elli. More colors and color wheels in my life, please. Just bought vintage film reel because with reminded me of a color wheel... time to play with that!